Check out my article about visual artist Cedric Michael Cox featured in this week’s issue of Cincinnati Magazine! The magazine hit shelves this month and is available all over the Cincinnati area. You can also find it online here. The cover of the October 2010 issue of Cincinnati Magazine. Cedric Michael Cox is wide awake as he trots down the stairs of the Kennedy Heights Arts Center. He was up most of the previous night, preparing for an exhibition at the Weston Art Gallery, but the hours spent in his Over-the-Rhine studio don’t show. The 34-year-old seems as fresh and feisty as the kids waiting for him in the classroom of the old mansion on Montgomery Road. Quill »» Generation J: Can non-profit news pay off for Gen J? Check out my article about non-profit journalism featured in the latest issue of Quill, the Society of Professional Journalists‘ national magazine. 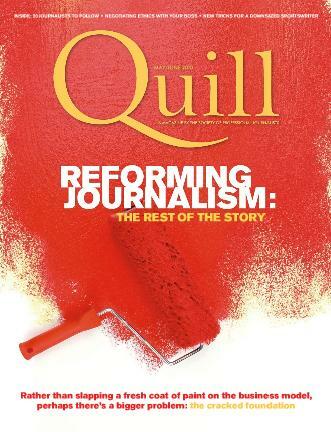 The cover of the May/June 2010 issue of Quill magazine. In retrospect, I can see why the folks at SPJ asked me to write this piece; I fit the demographic for the Generation J column (a feature that covers young journalists each issue) and I had some applicable experience. They knew I’d learned a little bit about non-profit journalism while working with the San Francisco-based, non-profit online magazine called WireTap through a fellowship last year. Check out my article about all-black folk band, The Carolina Chocolate Drops, featured in the May issue of The Progressive! The article hits shelves and mailboxes nationwide this month.